Last month we helped 20,958 people SAVE on their Auto Insurance. I know you want to be sure that your completion is reported correctly. I am a real person and it’s my job to interact with the courts and DMV to make sure that it is. Get ready to save on your insurance! You will be up and running in less than 30 seconds. By providing your telephone number, you consent to receive text messages sent through an automatic telephone dialing system to provide information regarding your account and our services, including your FREE reminders and course progress updates. You are not required to provide your telephone number to purchase our services. We offer text message reminders and updates free of charge, but your network provider’s message and data rates may apply. I know this process can be confusing to navigate, that's why I'm here! To help YOU if you have any questions. 100% Online - New York law requires that you take a refresher course every three years to maintain your insurance discount. Select this option if you took defensive driving course in the last three years and need to renew your certificate. 100% Online - The course is accepted by Taxi and Limousine Commission for Taxicab Driver License for both New Applicants and Current License renewals. All Licensees must complete and pass a NY DMV approved Defensive Driving Course at least every three years. TLC will only accept original certificates that will be mailed to you upon completion. You may also qualify for a discount on your personal policy upon the completion of this course. Technically Challenged? No problem our online course is offered through a vast network of affiliates thought the state. Click to find convenient location and class schedule. Note you will need to call a selected classroom provider directly to register. Everyone can use a break on their insurance - It's our mission to help you get through this course with a smile. Certified by NY DMV for Point Reduction and 10% Insurance Discount. within 30 minutes after you finish the course and will send you the original in the mail. Rain, snow, or shine - our U.S. based support team is here 7 days a week ready to assist you with any questions you may have. Access your New York defensive driving course anywhere, anytime, and from any device. Created by the famed Improv Comedy Club, our Improv Defensive Driving NY course provides a convenient and cost-effective way to complete your defensive driving class online. Based on a simple notion that a NYS Approved Defensive Driving Course doesn’t have to be dry and boring, our online NYS Approved course has undergone numerous studies and has proven effective in reducing future tickets and accidents. "Defensive Driving designed with you in mind"
Take advantage of our free express registration above to get started immediately. We are confident that you will like the simplicity of our traffic school course, but want you to be your own judge. No commitment. No risk. Just sign up today and enjoy your course right away. We will mail your original proof of completion certificate the day after you complete the course (you should receive it within 5-7 business days). That’s it! We will also electronically report your completion to the NY DMV within 30 days. Improv Defensive Driving was created with a single mission in mind, to offer you a fun and simple alternative to those boring defensive driving courses. Since then, we have helped over 3 million students and we would now love to help you! From students who took our Defensive Driving course in New York. This is a good course, it reminded me of things I should have known and forgot over the years of driving. The course was very informative and interesting. It was a great way to make this information easy to absorb. I loved doing this at home. Being able to take breaks at home when I needed them was awesome since I am disabled and sitting for a 6 hour class is nearly impossible. I have already recommended this course to friends and will continue to do so! Thanks for creating this course! I will never take this course in a class setting again. I liked being able to take it at my my own leisure while in the comfort of my own home. I didn’t have to worry about getting to a class on time or having to find a babysitter for my children. It was interesting and entertaining. Thank you. This was great. In today's day and age, time is limited. This customized approach to obtaining a defensive driving certificate is long overdue. Thank you!!! I found this course very interesting and entertaining. It was convenient for me, as I am a stay at home mom. The teacher made this course funny and enjoyable to watch…I truly learned a lot. Taking it online was very easy to work into my schedule! My wife took this course a few years ago and I have to agree with her that it much easier to take at home than at some driving school. Thanks, great program. I was pleased to find that I was already driving using many of the suggested practices recommended by this course but the delivery of this course, as compared with others, is infinitely better. Thanks. Really enjoyed this course. Nice having the flexibility of coming back to it whenever you like. I think most drivers should take this course to refresh themselves on their own driving habits. Great online course. I liked that I was able to schedule the course around my busy schedule. This is one of the best defensive driving courses you can take. The advice is very useful, and I actually remember everything. I apply the lessons later that same day when I am driving! Highly recommend this to anybody who needs the reduction in premiums or just wants to be a safer driver. Absolutely loved hearing Charles Fleischer doing the narration! I initially did not believe a course like this, much so that it’s an online one can be that effective. After completing it, I am a true believer and a changed driver. I highly recommend this alternative delivery method by Improv! I am thankful to have had taken such a helpful, easy to use, defensive driving course. I learned a lot of interesting facts, statistics, and other information that will result in me becoming a better driver. I was very surprised at how easy and informative this course was. It helped me review my driving habits and allowed me to realise how adjustments I needed to make. I definitely believe that I will be a more conscious and considerate driver. The insurance reduction course was not boring at all. The content was informative and a great refresher. This course was very convenient, engaging and interesting. I found there examples to be funny but at the same time they applied to real life situations. The system was very user friendly and i enjoy taking this course. Thank you! I was very happy to complete the course in my home rather than spend two nights elsewhere. The course was enjoyable, not boring. Thank you. I found it very convenient to use as I have a very busy life. I could return to it whenever I had a little bit of free time, it was great. Also I enjoyed the intro videos, very humorous, it kept my interest. The defensive driving course was much easier than I had expected! I thought the course is really well done. The information is laid out well. I learned a lot of interesting facts and statistics that I never realized before. This is so much better than going to a classroom. Better in a lot of ways. One the comfort of your home. Two it can be taken at your own pace. Third it was funny, interesting, and not at all boring. I learned a lot, laughed a lot and really truly enjoyed it. I’m glad this defensive driving course came out in New York. This was a breath of fresh air from the online continuing education course for real estate that I STILL have no finished because its so boring! This was very engaging and interesting and I will definitely recommend this defensive driving course to my friends and colleagues. I took your online defensive driving course in NY and really enjoyed it very much and I am looking forward to taking it again J. I think it is the best thing that New York State has come up with as of late. I am going to recommend it to my friends and co-workers. Thank you! The course is really Simple and Fun… Wow what a great service!! It was great, easy, and fun. I will recommend to my friends if they were to need your service. Thank you very much! Best defensive driving school I have taken so far. Thank you for offering this great defensive driving program in New York. This is my second attempt at an online defensive driving school and this one was the best! I will recommend to all my friends! I must say I’ve heard horror stories from my friends about taking defensive driving school class. I honestly don’t have one bad thing to say it was really simple and enjoyable. The Improv Traffic School has made this process an actual joy to experience. I’ve gained some knowledge, had a good time doing it and everyone who helped me on the phone was so incredibly kind and sweet. THANK YOU! Blessings. It was the BEST NEW YORK DEFENSIVE DRIVING SCHOOL that I ever took and I actually learned few things. You can always count on Improv Traffic School… your customer service is fantastic. I made my entire family take your Internet Defensive Driving Course. What a great service for New York drivers… anyone can use an insurance discount in these hard times. Your accident prevention course rocks! Your customer support is outstanding… I will recommend this defensive driving course to all my friends. What a great defensive driving course, every New Yorker should be required to take this. This defensive driving course is awesome! This is really great service for NY drivers, this is my second time doing defensive driving and I really enjoy doing with you, after 3 years I will be back. I have taken the classroom course 3 times, and the last time the instructor was pretty entertaining. This course, however, was much more convenient and also entertaining. This course was excellent and entertaining while delivering important life saving information. I plan to see if IMPROV has other types of classes because their delivery was excellent. How do I get the insurance premium reduction? Who should take the course for discount? How often do I have to take the course? Every three years for an insurance discount; You are allowed to take it for point reduction every 18 months if needed. Will young and minor drivers and drivers participating in the assigned risk pool receive the insurance premium discount? Yes. Any insured driver who is the principal operator and completes a Point & Insurance Reduction Program course will receive the 10% reduction. Another benefit of competing this course is a point reduction. If you accumulated too many points on your driving record this will help to prevent you from getting your license suspended. Completion of the course will provide you with a 4-point credit that will be subtracted from your driving record point count. This will depend on your individual policy. The state mandated discount is 10% from the base of your collision and comprehensive portion of your policy. Many of our students averaged anywhere from $900-1$500 over the course of three years. A. First, complete the course at your convenience in the same day or over 30 days; it's up to you! B. Your original certificate of completion will be mailed to you the very next day after you complete the course. We will also report your completion to the DMV to ensure your point reduction. I-PIRP is an acronym for the Internet/Alternate Delivery Method Point and Insurance Reduction Program. It’s also known as New York Defensive Driving Course Online. Who is eligible to take this course? Any New York driver is eligible for this defensive driving course and will save money on their insurance whether they have points on their driving or not. Will I save more if members of my family take the course? Yes, the insurance premium will apply to all motor vehicles principally operated by members of the family who complete the course. Please note that the discount can be applied to only one driver for each covered vehicle. To confirm the exact amount you will save, please contact your insurance agent. Will the PIRP course prevent my insurance company from raising my premiums? No. PIRP does not prevent general premium increases, or premium increases due to violations or accidents. It provides a 10% reduction for three years, from the base rate of your current liability, no-fault and collision premiums. So this way you’re always saving money even if your rates go up! State rules require that all I-PIRP courses are a minimum of 320 minutes of instruction time. The good news is you have 30 days to complete and can log in and out as many times as you like. The course is accessible 24/7! Who should take the defensive driving PIRP course? Each person with a New York driver license listed as a principal operator on an automobile policy must take this course in order to be eligible for a discount. Example: if a family consists of a husband, wife and a teenaged driver who own 3 automobiles, all three operators must take the course to be eligible for a discount on each automobile. After I complete the New York Defensive Driving course, how do I receive the point reduction? We will notify the NY DMV after you complete the course. A notice will then be entered on your New York driving record, and the NY DMV computer will automatically reduce your active point total by up to four points. "Point reduction" means the NY DMV will not count up to four points on your driving record toward license revocation or suspension. Points must have been applied to your driving record within the past eighteen (18) months to qualify for reduction with this course. We will also mail you a certificate of completion to present to your insurance company. Do I have to take a test? There are short multiple-choice quizzes at the end of each chapter but no Final Test is required. What if I don’t pass a quiz? They are so simple, it’s virtually impossible not to pass! All you need to do is answer 3 out of 4. But if you miss it, all you must do is take it over until you pass. Yes. You can log in and out of the course as many times as you wish, allowing you to take the course in increments rather than all at one time. However, the NY DMV requires that you complete the I-PIRP course within 30 days of the date you register for the course. You can complete the course in as many sessions as necessary, but you must complete the course within 30 calendar days of registration. Your data will be stored on-line for each course session. You bill be assigned a user ID (your DL #) and a password (which you choose) when you register for the course. You can use your ID and password to log in on any computer that can access the Internet with an acceptable connection. What is the hardware and/or software requirements for your course? Any desktop or mobile device with an internet browser is good to go! Now! And if you have any questions you can call us, email us, or use our friendly live chat! 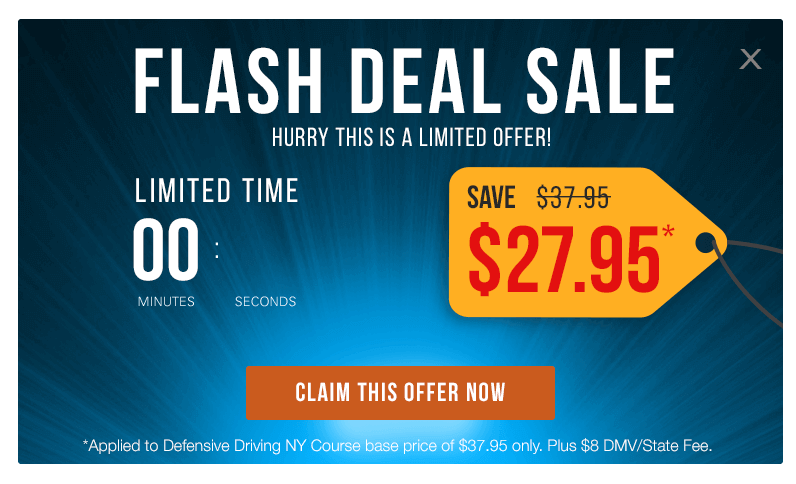 How an Online New York Defensive Driving Course Can Save You Money…and More! The Point Reduction Program - Online!